Student follows the straight line of the static rope held by two turners starting at the right shoulder of the lead turner (coach). Student crosses the rope at the middle where it hangs the lowest and exits to the opposite side from entry. Student waits for all others to follow before repeating to the other side. Go to the next step when the figure eight travel pattern has successfully been established. Student passes through the turning rope without jumping following the figure eight path. 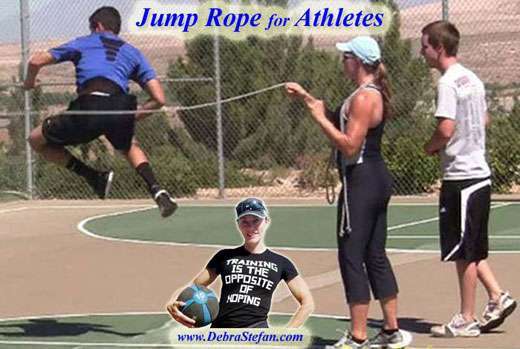 Student stands directly to the right shoulder of the coach and proceeds when the rope is down. Continue until all students can time their own successful entry without hesitation. A static rope is held by both turners and jumper stands on the entry side directly in the middle (halfway between both turners). Student watches the rope and jumps ONCE as the turner circles the rope up, over and down then exits with a “high-five” to the turner. Continue until the timing is successful. Jumper combines the above skills to enter the turning rope, do one jump and then exit on the opposite side with a high five. Once this is successfully accomplished, the jumper can “climb the ladder” by jumping one extra jump on the next turn until reaching 10. Once you view these videos feel free to contact me if you have any questions. I am happy to help.